This past weekend I went to the Beatles festival called "Beatles at the Ridge" in Walnut Ridge, Arkansas. This event has become my favorite Beatles convention, and I know that many of you might wonder what makes it so great. What I like about Beatles at the Ridge is that is a much more relaxed atmosphere than at other Beatle conventions. The people of Walnut Ridge are very kind, and the quaint small town adds to the laid-back vibe of the event. The town of Walnut Ridge always has a Beatles theme going on regardless of when you visit. The "Abbey Road" Beatles sculpture is never removed, so if you are in Arkansas, make sure to stop by the town even if Beatles at the Ridge isn't going on. But when it is time for the festival, the entire town decorates in peace signs, tye-dye and Beatles decore. 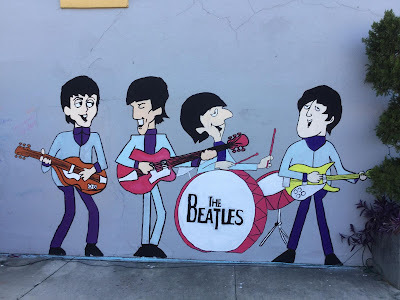 This year some high school students painted the cartoon Beatles on the side of the building. There are also wooden cut-outs of the Beatles and the Yellow Submarine, which make for great photo ops. My favorite decoration this year was from the library. They made the Yellow Submarine entirely out of post-it notes! 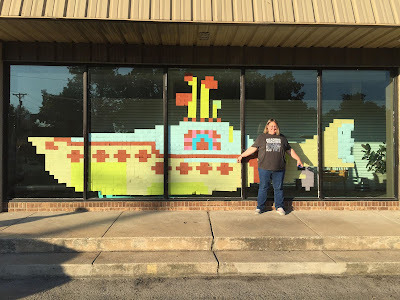 Standing with the post-it note Yellow Submarine. On Friday night and all day Saturday presentations were going on in the building called "The Studio." This building also houses the Argenta photo collection, which is full of Beatles press photos that weren't used in a newspaper. It is a fascinating set of photographs. This year the main speakers were David Bedford, who spoke about his new book Looking for the Fourth Beatle and Vivek Tiwary who talked about Brian Epstein. Other speakers included Kit O'Toole (who talked about the White album), Marti Edwards, and myself (talking about the 1964 Beatles U.S. fan clubs). 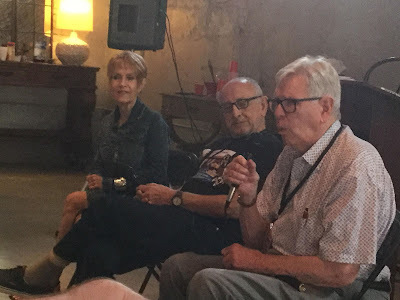 For me, the highlight of the weekend was Jude Southerland Kessler's panel discussion with Ivor Davis and Art Schreiber. Both of these men traveled with the Beatles as journalists on the 1964 N. American tour. They told the best stories! I got to hear all about George and John playing monopoly. Did you know that John liked to be the race car? The funny stories these two men shared were golden to anyone that loves the Beatles during the touring years. There was plenty of music from a Saturday morning sock hop to live Beatles music to a variety of bands throughout the day and Liverpool Legends to end the event. Unfortunately, I missed out on most of the music this year because of other responsibilities, but I heard that the bands were good. If you want to come to a fun, free, laid-back Beatles event - I recommend making plans now to visit Beatles at the Ridge in September of 2019.